There is a lot of weight and importance on the concept of memory. Solace in the revisitation of memories is a common suggestion for people who wish to comfort others that are hurting. I feel like there is an expectation that memories are forever immortalized in our brains, which is a lot of responsibility to place on our memory bank. When my Grandfather died, my mom told me to write down memories I had with him so that I would not forget them. I thought that was a good idea, but I never took the time to do so. Three years later, I realized what she meant. I have gone through a second stage of grief, distressed about how hazy my memories are of a person that I spent many years of my life with. I used porcelain as an assistant in helping me grapple with this grief by creating ceramic representations of childhood photographs. 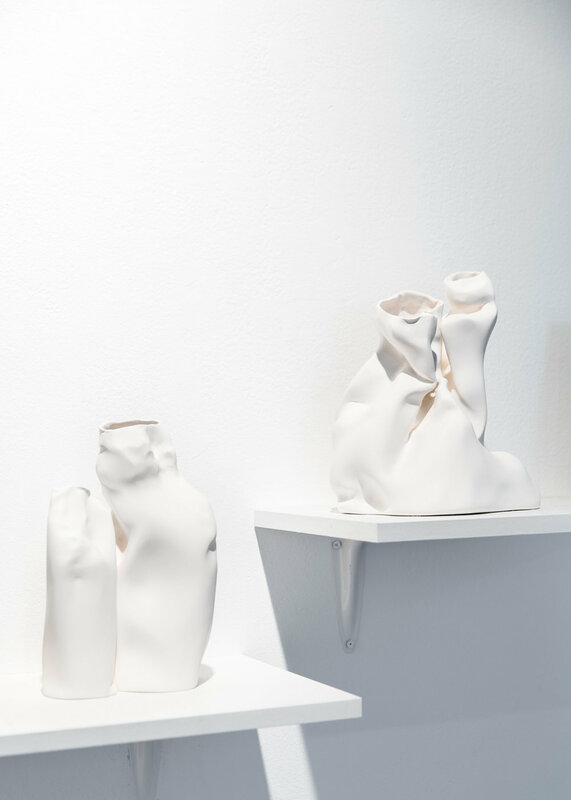 Through these fragile forms and the ethereal quality of porcelain, I hope to create a tangible visual of memory, as well as translating the fleeting and delicate nature of mortality and memory. I learned the naivety of the expectation that I can remember every special moment I had with him without any personal documentation the painful way. All that remains of my Grandfather are the tiny, unclear snippets of memory, and the photographs as proof that he was once here.